The design of the new “Terminal C” in Copenhagen Airport built on scientific studies of passenger behaviour. This blogpost gives an introduction to how we applied action choreography to make the boarding procedure more effective, so Emirates could get the world’s largest passenger aircraft – Airbus A80 – to take off on time. 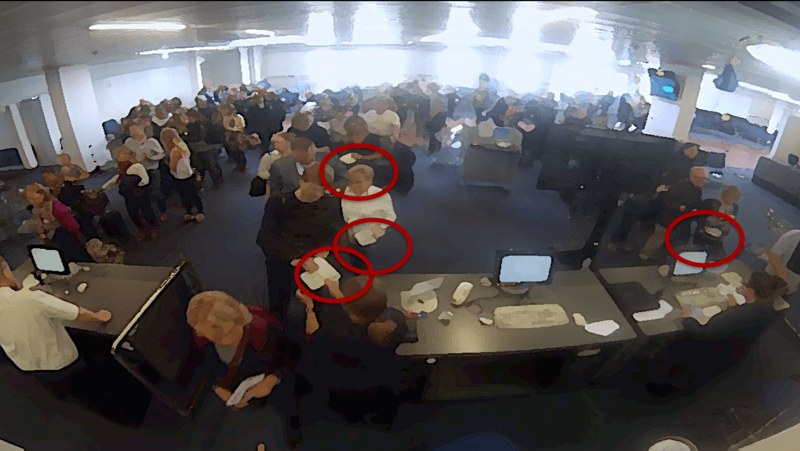 In the last blogpost we introduced the term action choreography using two examples: syringe boxes in hospitals and the security check in Copenhagen Airport. As shown by the examples action choreography is a very concrete and detail-oriented branch of nudging. It makes knowledge of the specific situation you work with, close observations, and data collection necessary prerequisites for success. But if we deal with an action being played out thousands of times, even the smallest difference in the choreography can have a big impact. This was the case when iNudgeyou in 2015 contributed to the design of the new “Terminal C” in Copenhagen Airport – an expansion of the airport that cost no less than 271 million DKK. The expansion of the airport with a new terminal was not only due to the airport’s continued growth, therefore receiving more and more international travellers, but also because Copenhagen Airport wanted to attract the world’s largest aircraft, the Airbus A380. This type of aircraft can carry up to 615 passengers, and it is mainly operated in Europe by the exclusive Emirates Airlines. Before Emirates would fly the Airbus A380 from Copenhagen Airport, the airport had to prove that it was able to handle the numerous passengers without delays and frustration. Thus, a rare opportunity for us appeared where we could test our scientific methods of behavioural change under almost ideal circumstances (many people, the possibility to control most of the key factors, but in a real world setting). That was simply too good a chance to let pass by. Therefore, we teamed up with the architect company Schmidt, Hammer and Lassen and designed a boarding area, through experiments and insights, that should handle more passengers at a faster pace, without renouncing the good passenger experience Copenhagen Airport has international recognition for. Ultimately, this meant that we were involved in determining everything from the location of the power outlets, the patterns in which the chairs should be arranged, and the detailed information processes given in the boarding area. One of the most important steps proved to be about highlighting some specific information at the exact right time – information creating an important action choreography. A cornerstone for the success of the project was that we could make the boarding procedure more effective, meaning reducing the time it takes for passengers to get around the chairs in the waiting area and into the airplane – and do it without chasing them around like sheep. It was a challenge because Copenhagen Airport could not build the optimal amount of bridges to Airbus A380, which Emirates was used to in other large airports. In addition to this it should be considered that delays not only make the passengers angry at the flight companies, but also have a high cost every minute. When the delay is due to the circumstances in the airport, the cost must be paid by the different companies responsible for getting the passengers on board, or the airport itself, depending where the responsibility for the delay lies. With so much at stake, a very thorough diagnosis of the behavioural patterns of the passengers was necessary. Through a technique we have developed called behavioural reduction, we broke down the challenges into the different behavioural patterns that give rise to bumps on the way when 600 passengers have to be boarded onto an airplane within 30 minutes. In other words, we broke down the overall issue into behavioural problems that make it possible to apply the three fundamental questions in behavioural science. Then we prioritised them according to importance. Such a prioritisation is not made by examining one’s own ideas, or interviewing travellers or staff. This is because experiences and memories are notoriously affected by cognitive bias, especially when it comes to negative experiences. Most travellers, myself included, think for example that the most critical behavioural pattern to be taken care of in the boarding process is queuing. Nothing sticks better in the memory of travellers than the psychologically painful experience of standing and waiting in a line of people – albeit with the exception of the extremely provoking experience where someone breaks with the system and tries to skip the queue. Similarly, such biases also apply to the employees experiencing the process up close every day. When we first spoke to the handlers who every day checks thousands of travellers’ passports and papers before they board the airplane, they could tell us that it was their impression that some of the biggest problems were caused by passengers with special wishes and troubles; such as upgrading to business class, families that do not have seats next to each other, people who believe they did not get their bonus points etc. After having served hundreds of passengers within a short time range it is not surprising that it is the problematic confrontations they tend to remember. However, through observation it turned out to be a completely different, and much tinier, behavioural pattern that at first made the biggest difference in the boarding procedure. Comprehensive observation and subsequent analysis showed that the largest problem was a quite different one; namely that a small behavioural problem occurred with extremely high frequency in every boarding. Many of the travellers were not aware that they should show their passport and boarding pass when they got to the handler at the end of the line, even though it was written on their travel documents. The result was that they often had only one of the two required documents ready. Therefore, there was a great potential to gain if we could make the travellers aware of the right time where both documents should be shown, and get the travellers choreographed to show the documents in such a way that staff could scan them easily and effectively. The solution was rather simple. We installed TV-screens at the queue with pictures instructing the travellers that both documents should be shown, and that they should be shown in a similar way as I imagine how North Korean boarding school students would have done it. 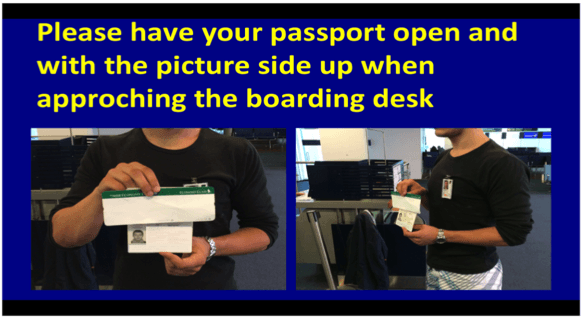 We conducted some measures of the boarding procedure with and without screens, looked at the data, and reached a very surprising result. The simple action choreography of the passengers in accordance with that information they already had in their travel documents, lead to an average reduction of 1.08 seconds per passenger (from 7.41 to 6.33 seconds). It might not sound as much, but when you scale the result up it means an efficiency improvement of 4.46 minutes for an average aircraft. Comparing this result with the fact that an Airbus A380 must be boarded within 30 minutes in order to take off on time, and the cost every minute of delay causes in terms of money and angry passengers, then it is a quite prominent result for a small but well-timed nudge based on the thoughts of a simple but appropriate action choreography. Highlighting how to show travel documents was far from the only initiative required to create an elegant and effective behavioural architecture to send you on vacation or business trip on time. 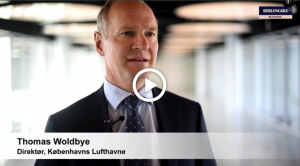 The administrative director of Copenhagen Airport, Thomas Woldbye, talks about some of the other initiatives we developed together with Copenhagen Airport (the video is in Danish).